When we learned that Triumph had revamped the engines in its Bonneville line, we had high hopes for what modern power would bring. However, we had no idea how substantial the result would be. 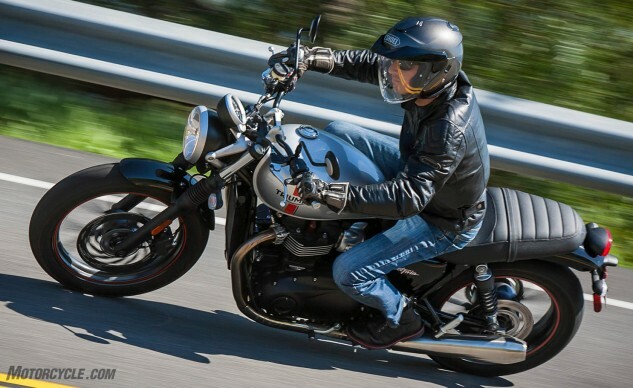 Take the Triumph Street Twin, utilizing the smaller of the two engine sizes created in Hinckley, the Street could be looked at as Triumph’s entry-level bike. Although it is, that would be missing the point by a mile down your favorite winding road. Put head-to-head against the other new middleweight roadsters in our Retro Roadster Gaiternational Shootout, the Triumph decimated the competition, winning by a 10-point margin on our 100-point scale. Although Triumph’s latest engine is 35cc larger and liquid-cooled, the Street Twin’s bottom-end power is emphasized instead of the outright peak. The engine, relying on ample torque and buttery-smooth EFI tuning on the bottom end, is sure to appeal to new riders who are earning their riding chops. The slip/assist clutch also offers lower clutch effort to make launching the Street easier for newbies and smaller-handed riders alike. The Street Twin also impressed our testers with fit and finish on par with more expensive motorcycles. Appealing to new riders is good, but saddling the Street Twin with the beginner-bike label would be grossly inaccurate. 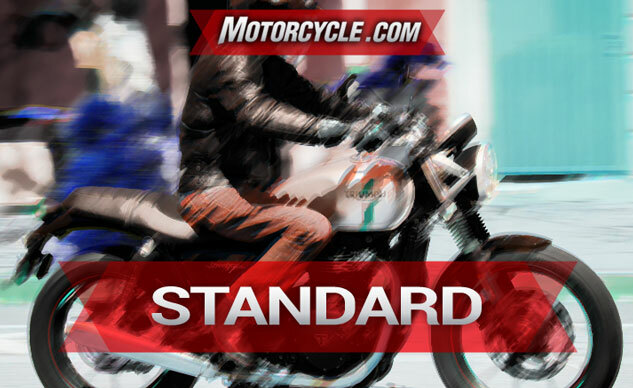 The Street wins the 2016 Best Standard Motorcycle award for being a phenomenally well-rounded motorcycle. In our shootout, it won all 11 subjective categories from engine, suspension, and brake performance to cool factor and desirability. The Street Twin is not only a great bike for novices, but also delivers top-shelf entertainment and performance for experts, as well. Add in current technology like ABS, ride modes, and TC, and the Street Twin fills all the check marks for a modern motorcycle. The best part is that Triumph managed to cram all this performance and technology into a bike that carries the same historic profile of the Bonneville it replaced. When a manufacturer has the lineage that Triumph does, a razor’s edge must be walked to prevent the sacrifice of either historic characteristics or performance in pursuit of a new interpretation of a renowned motorcycle. Triumph successfully navigated this obstacle. In the Street Twin, Triumph captured the look and flavor of the previous Bonneville while producing a package that could lead style-focused young, new riders into the motorcyclist fold while still providing a massively fun riding experience for enthusiasts that have many thousands of miles on their personal odometers – all at a $8,700 MSRP. Suzuki packed a huge bang into each of the 10,499 bucks riders will pay to own the new GSX-S1000. Beginning with an engine based on the long-stroke 2005-2008 GSX-R engine (often considered one of the most versatile GSX-R power plants ever produced), the Gixxus threw down 143 hp, second only to a bike costing $6,500 more in our recent Naked Sports Six-Way Shootout. Yeah, you read that right. Also, even with that impressive power delivery, the GSX-S managed to churn out the most miles per each gallon on our Central California thrash-fest. 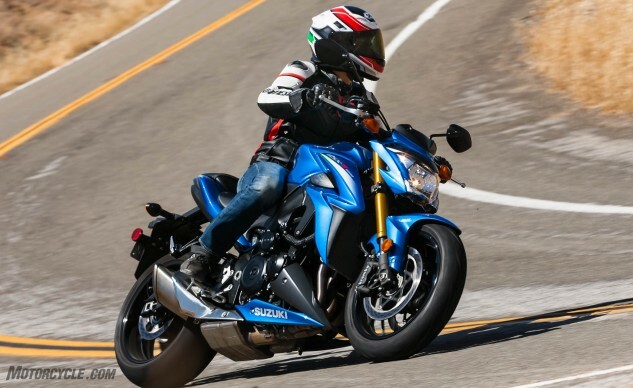 The Brembo brakes and the Bosch ABS also shine when the Suzuki is put through its paces. If only the suspension were as good as the engine and brakes are, the GSX-S1000 might be the Best Standard Motorcycle instead of the Honorable Mention. However, of all the things Suzuki could have chosen to cut costs on, the suspension might be the easiest for an owner to fix. With the Suzuki GSX-S1000, Suzuki provides an excellent platform for challenging whatever pavement you spend your riding time on and sculpted it in a stylistically pleasing form – all for just $10,4999. For the rider who wants an open-class standard on a limited budget, the Gixxus is a hard bike to beat. We wouldn’t be surprised to watch it become one of the most popular project bike platforms in the near future.